Belgian style beers have always fascinated me, especially the tripels and quads. So much potential flavor with so few ingredients. 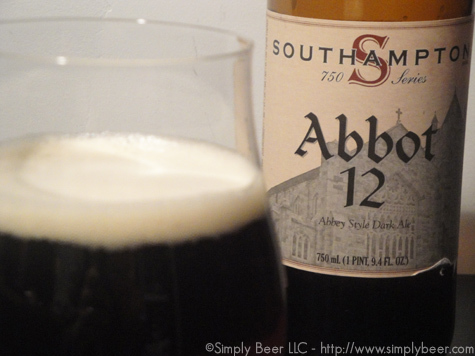 I haven’t had many beers from South Hampton, so I was looking forward to this strong dark ale. 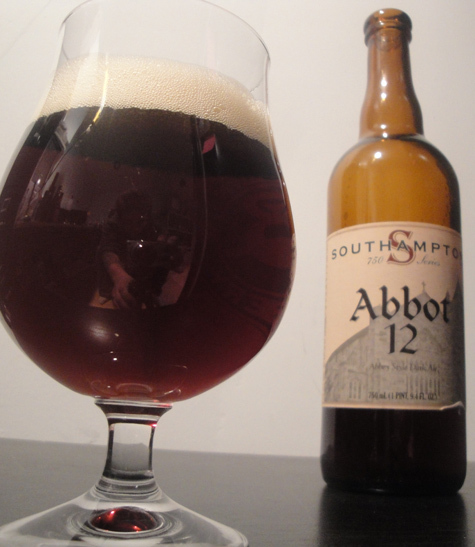 At 9.9% abv this Abbot 12 would be considered a quad. A strong, dark ale with notes of raisins, figs, and caramel, and a pronounced “dark rum” character. Deceptively smooth at 10.5% alcohol, this strong ale is ideal as an after-dinner sipping brew. Pours a deep mahogany color with ruby highlights and a brilliant white head. A nice bit of lacing accompanies this head. A good torrent of super tiny bubbles comes straight off the bottom. This beer has a big aroma, tons of fig and alcohol on the nose. Aside from the fig and alcohol, there were notes of malted toffee, sherry, and raisin that really warms the nose. Quite a tasty beer, moderate mouth feel, very even through . A very fruity figgy beer, big alcohol presence that is almost hidden by a malt sweetness. One of the things I like about this beer is how closely its flavor resembles the aroma. The figs and malt sweetness dominate with the alcohol, but there are also undertones of sherry, raisins, and good yeasty esters. This is an excellent sipping beer; great after dinner drink to share with friends. It’s a high abv beer and the booziness makes this a great beer to go along with desert or cigar.